I seem to have spect an awful lot of time thinking about what to do rather than just doing it. My recent acquisition of a copy of Battle Cry has served to inspire me in many different directions which is probably the boost I needed in order to make something happen. I really like the figures in the game (they are a big improvement on those from the original version) and with this in mind I am planning to acquire a second copy. They are scaled at 20mm so would be ideal for use in a wargame - and that is exactly what I am planning to do. As is usual with me I will be making use of every component included in the game with the exception of the rules. I prefer the Napoleonic version of the Command and Colours system to the ACW one and so will be more likely to use either those or a fusion of Bob Cordery's Memoir of Battle derivative with a smattering of my own ideas. One thing I am going to tackle though is something a little different but given my fondness for my block armies should come as no surprise. I want to produce a couple of armies using those quite splendid 3mm or 1/600th scale troop blocks produced by Peter Pig in support of their Hammerin' Iron ACW naval rules. The range covers all that is needed in that there is an infantry block, a cavalry block, an artillery block and one for skirmishers and the inevitable command. I am conscious of the huge range of 2mm blocks that Irregular Miniatures produce and indeed, I have owned a few of these over the years but have never really progressed anything with them other than a brace of DBA armies for the Punic Wars. The 3mm blocks are a better fit for what I am planning and have the critical advantage of being more painter friendly in my opinion than their smaller counterparts from Irregular. The fact that Tumbling Dice also produce some models in this scale designed for the 20th century - not to mention more aircraft than you shake a stick at - is also a major consideration for me as well. The size of a standard Battle Cry playing board would suit the use of single 3mm troop blocks representing an individual unit with the use of markers of some kind to record hits. For use with Hexon one could simple use 4 infantry, 2 cavalry or two artillery blocks for the standard units and merely remove a block when a unit takes a hit. Most importantly though, the game would have that 'en masse' look of whole ranks of troops rather than a few figures. The figures in the game I intend using with larger units when using Hexon - my thoughts at present are towards 6 or 8 figure infantry units 4 or 6 figure cavalry units and a pair of guns for the artillery. This will go some way towards the impression of massed ranks of troops in combat. Mention of Tumbling Dice and the 20th century should also serve as a clue as to what else I am thinking of in this scale - specifically the Balkan Wars or WW1. There is also the tempting possibility of WW2 as well - and I am very aware of the models available from Pico in this scale! The geat thing about the 20th century in this scale is the variety of armies one could represent with three basic paint jobs - grey, khaki and olive green. Certainly the main bulk of infantry could be used for pretty much anything and by adding period and army specific vehicles can be tailored to suit any conflict or theatre imaginable. The same is also true to the ACW blocks from Peter Pig although the cast on flags mean that the country of an army would be defined rather than the period being represented. Painting flags in 1/600th will be interesting although I have a cunning plan for this. All in all then this little foray back into a period I had resigned myself to not gaming - the ACW - (and the inspiration to do so came from a most unlikely source!) has served to give me a much needed shot in the arm and has set in motion a train of events that are leading to who know's where? It was a busy day at Chez Crook on Friday 18/09. That was the day that my brilliant and beautiful daughter Holly moved to Reading University to start her four year combined Honours degree in Fine Art and Psychology. She has worked really hard to get to where she is and has had to overcome a number of personal challenges as well (and no, that does not include being my daughter....). 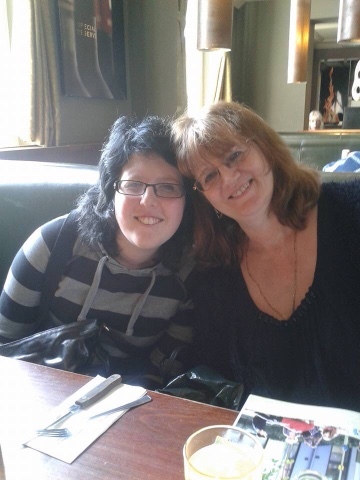 We stopped for lunch at a Beefeater restaurant - I had no idea they were still going - which is where I took the above picture of Holly and her mum. I don't mind admitting there were a few tears but she seems to have quickly adjusted to student life - in a good way as well. Around ten days ago I finally got around to ordering a copy 150th Civil War Anniversary edition of Battle Cry by Richard Borg. I have a couple of cunning plans to go with this acquisition but for now I was looking forward to some Blue and Grey action in an attempt to try and galvanise some enthusiasm. The ACW as a gaming period has had a chequered history with me - I think my feelings of apathy were as much a result of the rules in use rather than not being interested in the war between the states. Acquiring a copy of the game would enable me to fight the battles of the period in a style I would be comfortable with. The parcel arrived yesterday morning and that is where the problems started. My son came home and placed the parcel in the house. We arrived home around 8pm and I immediately spotted the large padded envelope and knew what was inside. I should have known that things were slightly awry when water started to pour from out of the envelope. I opened the package and mercifully the box was shrinkwrapped. This protected it from the worst of the water but there was a small hole in this that allowed water to seep in and essentially ruin the side of the box that was in contact with the ground. Luckily the contents are in a plastic storage tray so were not in the least bit damaged. To say I was less than impressed with the post office is perhaps an understatement. I duly completed the online claim form and took copious amounts of photographs by way of supporting evidence and now have to wait up to 30 days for them to hold their hands up and compensate me. The game itself is fine and undamaged but this is hardly the point. I would have preferred the inconvenience of a visit to the Post Office to collect the package rather than having to go through a tedious claim process - all because the Postman could not be bothered to take it back to the depot or even try one of our neighbours, both of which are retired and seldom out and about. Still, the main components are OK so I can start using them sooner rather than later. I am not really surprised that it has been nearly a month since my last post - work and real life dramas have certainly taken their toll (especially the latter!) - so it is with some relief that I am finally putting finger to keyboard to update all and sundry about what is going on in Chez Crook. You may recall that I had taken the decison to have some figures professionally painted and therein has lain some of the problem. I have really struggled to make up my mind as to what to tackle first! I know the sizes of the forces I want to raise and am also pretty much decided on the scale - DBA and a half for the armies and 15mm for the scale - but pinning down a period has been a challenge I can tell you! I think I am pretty much where I want to be in this respect and I suspect that the end result will be no great surprise to most readers of the blog. I want colourful troops so at this stage WW1 and WW2 are not in the running. I am giving consideration to a few armies of around 1880 meaning British (Sudan rather than NW Frontier), Colonial French, Turkish, Russian, Mahdist, Zulu and even Boer are all in the mix. Ideally I would like to get three forces initially with one of them being a native type army. I am still pondering this and as I will not be in a position to commit to anything until the end of October there is plenty of time. Planning and pondering has been very much the order of the day for me over recent weeks which is oddly therapeutic even if it does not translate into anything tangible. I have not been idle on the retail therapy front and have scored a couple of nice items from our local boot sale - The Ashanti Ring by Leigh Maxwell and a copy of the Lord of the Rings Risk variant - for which I have a cunning plan. I have also picked up a couple of items from Ebay including the title you see above, again, I have an idea for this and finally I got around to getting a copy of the newest version of Battle Cry by Richard Borg. 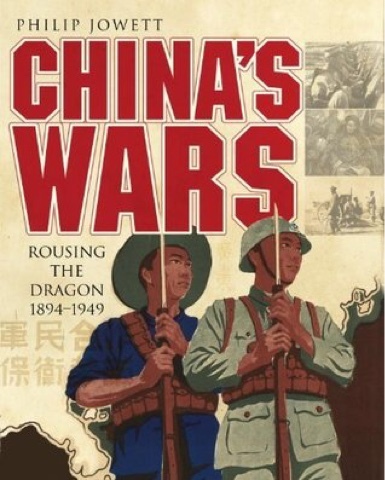 China's Wars by Philip Jowlett covers not only the civil war but also the war against the Japanese and as both of these I know next to nothing about I am hoping this title will rectify matters. When the words 'Civil War' are mentioned one usually thinks of any of the English, American, Russian or Spanish as a rule so the Chinese version will make a nice change! I have a few other ideas rolling around the brain cell but this will be enough to be going on with methinks!